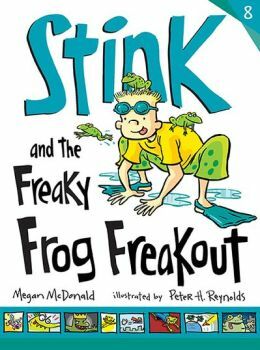 Stink and the Freaky Frog Freakout is sure to make its way to reading lists as it will stretch both reading skills and science literacy. This eighth book in the Stink and Judy Moody series by prolific author Megan McDonald takes Stink on a froggy adventure. Stink Moody can’t swim his way out of the Polliwog level swim class because his head just won’t go under water. Then, frogs start popping up everywhere – in his shower, boots, and bathtub. Stink bonds with the frogs and convinces his friends to visit a vernal pool. There, they learn about challenges amphibians face such as shrinking habitat and pollutant-induced mutations. Croak! Squeenk! Ribbet! Stink is not happy about that and decides to join a frog-counting project. When Stink is licked by a blue frog (surely a radioactive mutant), things get a little freaky. As he hippity-hops through the day, Stink gobbles up once-despised raisins which now look like tasty flies. The webbing betweens his toes seems to grow, and he is tempted to spend the night in the dark, damp basement. When he is eager to go to swim class, Stink’s sure he’s turning into a frog! The story comes to a comforting conclusion as Stink froggy-kicks his way across the pool, happily dives underwater, and ribbets his way from the polliwog to the frog level in swim class. With plenty of boy-appeal and humor on the third grade level, this book will inspire future scientists. It is perfect for young readers who enjoy froggy facts and reading games such as fun quizzes. (Did you know Northern green frogs eat their own dead skin?!) Several pages of Stink Frog superhero comics will please graphic novel fans. Although the text includes a few inaccuracies (for example, the implication that skinks are amphibians), teachers will appreciate the scientific content (life cycle, scientific skills, field science techniques) as well as the conservation message. The classic classroom activity to accompany this book is raising tadpoles, but the book would also complement field trips to a pond or wetland area and a unit on freshwater ecology. Additional resources and lessons can be found on the website of the Center for Global Environmental Education, A Thousand Friends of Frogs (http://cgee.hamline.edu/frogs/), a project begun by students who found malformed frogs and decided to do something about it. My grandson loves this book. He just finished reading it. Is there anyway I can get a copy of quiz questions I can give him to see how well his reading is getting. He wants to get more of these books and over the summer I want to quiz him over the material. Not sure about quizzes, but the publisher has some excellent activity packages. Go to http://candlewick.com/cat.asp?browse=Title&mode=book&isbn=0763661406&pix=n for complete title information or http://candlewick.com/book_files/0763661406.kit.2.pdf for a classroom guide or http://candlewick.com/book_files/0763661406.kit.1.pdf for an activity kit.